Corduroy is another story I read as a child and adored. It is a well loved classic. 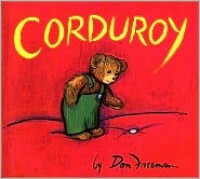 Corduroy is a story about a teddy bear in a store who is missing a button on his overalls. Because of this, the children who come into the store do not want to buy him. But one day a little girl comes in and falls in love with Corduroy, but her mother will not let her buy him, and that he doesn't look new since he is missing a button. Corduroy decides to try to go find his missing button that night when the shop closes. In the end he ends up back in the store without a button, but the next day the girl shows up again with money to buy him. She sews on a new button to his overalls saying that even though she loves him the way he is, he would probably be happier if she fixed him. This book would be awesome for a classroom lesson on loving others despite their flaws, and loving themselves despite their flaws.